The Fourth Street Viaduct (53C0044), a 1837 ft long bridge built in 1930, was last studied in August of 2013. It's a long viaduct with a single 280 ft arch span across the Los Angeles River. 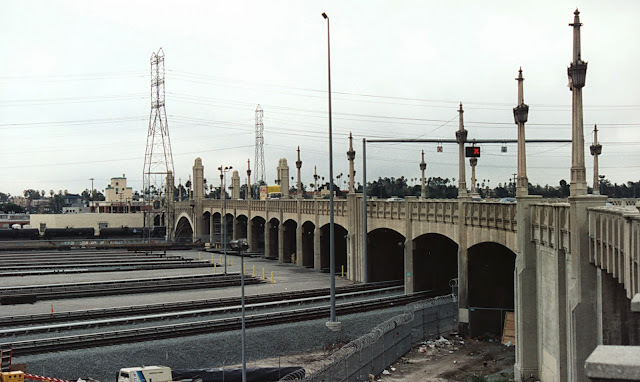 Not only do the bridges in downtown Los Angeles have to cross the river, but they also have to cross a wide railroad switching yard. This is another of the 'Beautiful City' bridges designed to make Los Angeles into a city of stature and importance. Today, this area is mostly warehouses and transients, with the downtown workers scurrying to their homes at night. The Disney Hall, Dolby Theater, Dorothy Chandler Pavilion, etc. entice visitors back downtown in the evening. We'll discuss efforts to transform the downtown area and the Los Angeles River in more detail tomorrow. Los Angeles County, California Bridges: Fourth Street Viaduct across the Los Angeles River (3) by Mark Yashinsky is licensed under a Creative Commons Attribution-NonCommercial-NoDerivatives 4.0 International License.